During my TTC years I bought a couple of magazine subscriptions, one for Conceive and the other (rather optimistically) for American Baby. I can’t prove this, but I’m pretty sure that one of them sold my name to a marketing company, because not long after that, I started getting baby related mailings. I received samples of formula and diapers, and ads for baby photographers and maternity wear. It was awful, but it didn’t stop there. The marketing company seems to have got the impression that a baby arrived in our house at some point and so sent age-appropriate marketing as the years ticked on. It’s been five or six years now and the mailing have definitely slowed down. This year I only got a few catalogs for educational toys and mommy clothes, and brochures for a pre-school and a Disney cruise. But come the holidays, it all fires up again. As if my mailbox isn’t already crammed with sufficient junk, I’m now getting fliers for family photos cards, and photographers who seem to think that the ideal gift is a portrait of my little brood. Little do they know that it consists of me, Mr. Fab, and a cat, and only two of the three would be willing to wear silly Santa hats. 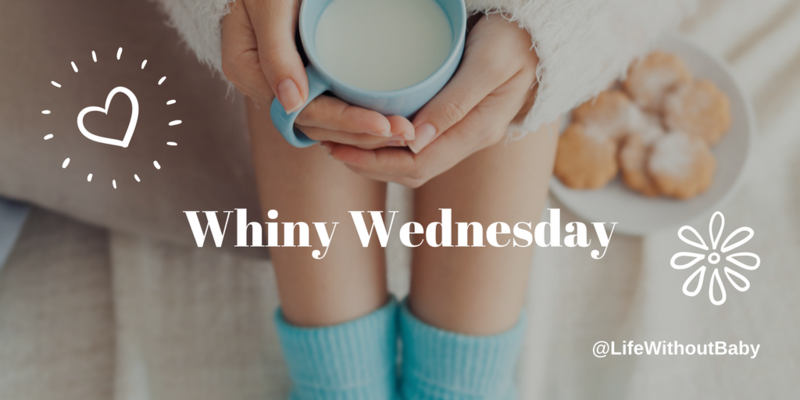 It’s Whiny Wednesday, there are only 18 shopping days left ‘til Christmas, and I’ve already got my Bah Humbug on already.